Dot writes: my sister wrote up her birth story as a note on facebook and said that I could cut-and-paste from it into the blog. So I’m cutting and pasting the whole thing. Jess was born at 12.10 on the 12th March. Today is her 1 week birthday and this is the third day she has been home from hospital. (She came home on Friday evening, but that doesn’t really count as we went straight to bed). I’m told the birth was fairly fast for a first babe. My waters broke at about 11.30 on Sunday and we set off for hospital at about 06.30 on Monday. Whilst still at home I did get to listen to my labour music and Tiger kept me company on the couch (didn’t want to be lying down). Some time after we got to the hospital they checked my progress and confirmed I was in active labour and was 5cm dilated. I had a couple of hours of monitoring then got into the pool. The monitoring felt pretty constant even in the pool as I had hourly tests for blood pressure, temperature and sugar levels which didn’t leave a lot of time without tests. Almost as soon as I got into the pool I started needing to push. I managed to last a reasonable amount of time without, but did need to take some gas and air in the last stage. I got out of the water bath at that point for a check on my progress and Ben had to put the straps back on me for the next bout of continuous monitoring as I was so centered on giving birth I’d stopped really responding. Things are a bit scrambled in my head from here. We got to the bit where the cervix was almost fully dilated and they told me to stop pushing. The midwives said it was really close, only about an hour to go. I remember thinking ‘that’s not really close..’ Happily Jess didn’t take another hour. Four or five contractions later the midwives did a quick check and saw the head was begining to appear the midwives seemed a bit surprised; I think they were expecting it to take longer. It wasn’t that many more pushes after that when Jess arrived. It felt really quick after all those contractions. They delivered her onto my chest. She was covered in a thick layer of vernix and already had a full head of hair. The birth was unassisted and the placenta came out ok after a slight worry that I would need to go to theatre. Unfortunately I bled quite a lot after so did wind up having to go to theatre anyway. Ben looked after Jess whilst I was there and gave her her first feed (formula as I was not present). I came round sometime later with a really sore throat. Being home is bliss and Jess is a total darling and changing everyday. 7.10am. Dot abruptly gags on her piece of toast. 8am. On the way to work. Maybe I should get a pregnancy test, just to be sure. What if I’m expecting my third child too? Would I ever get back on my feet again academically? Thank goodness it’s not very likely. Anyway, too late to get that test now – I’ve got a class at three. My breasts feel achey. That’s another pregnancy symptom. What if I am pregnant? I’m already horribly behind with my research after two maternity leaves in three years. It would be the end pretty much. I’d have to leave. And Helen [colleague who would get dumped on with my teaching] would kill me. But what would we live on? This article about Anglo-Saxon booklists curiously fails to absorb me. Coils do fail. My doctor told me she’s known it to happen. The coil normally emerges in the placenta. Our house is too small for five. We’d have to move. Maybe we could get a house in the North County somewhere – Skerries perhaps – maybe we could afford room for five on my salary up there – if I can ever show my face at work again. Good thing it’s really unlikely I’m pregnant, right? Ken is talented; we’ll be lucky and there’ll be a job for him. Perhaps UCD will miraculously advertise something. Then I can stay home with the kids. Poor Frank. Talk about middle child syndrome. It’s hard enough paying attention to two when one of them is Hugh. What will the age gap be? Well, I guess this one will be due in [calculation involving fingers] June or July – oo, another July birthday – so Frank will be less than 22 months – good God, we’ll have three children under the age of four. Imagine the sleeplessness. We’ll just have to be ruthlessly efficient and have an extremely effective routine. 5.20pm. Dot leaves train at Dun Laoghaire, walks to pharmacy and buys pregnancy test. Can the woman behind the counter tell that I WANT THIS ONE TO BE NEGATIVE? My Head of School is very nice – I would be able to tell him – maybe it wouldn’t be so bad. Maybe people would forgive me and I could just push through and start doing proper research in 2012. And get lots of martyrdom points because I’d have been at the university over six years without ever getting my turn for research leave. And Ken could start his brewery business and the children could play happily together among the vats of beer, hardly ever falling in and drowning. We sold/handed down/freecycled all the baby clothes, the infant carseat, the baby bath, the co-sleeper cot, even the hooded towels. How stupid we were. Maybe Aura could let me have Maya’s hand-me-downs. Maybe it’s a girl. Poor girl, to come along when I don’t really want her. But I would want her by then, of course. Oh dear, how will we afford it? Will we need a bigger car? Maybe we should just give up and move to New Zealand and start again. Reinvent ourselves, be brave. Academia is doomed; the UK is proposing to slash and burn the whole sector; so is Ireland, probably; and let’s face it, Old English is scarcely at the forefront of the knowledge economy. And the Irish aren’t going to give other jobs to a kiwi and a Brit. New Zealand is a good country for children. Though possibly not for Old English specialists or philosophers. What would we live on? Maybe it would make more sense to move to Norfolk. How rotten for my mum to lose her grandchildren just as number three was coming along. We could live in my village and Mum could help with the babysitting. Wouldn’t she be thrilled. What exactly do the people who live in my village do, now they aren’t farm labourers? Ken could start his brewery in New Zealand and sell the beer to his brother. Or not. 5.47pm. Wee on stick. Wait. Well, it was never very likely. I have an IUD and two small, loud, ever-present human contraceptives. Should I be aiming to focus more on the chronicles aspect of my research or the emotions, or alternatively this idea of working on Cotton Tiberius B.i? Did I actually manage to hold it in the stream for five seconds? in my belly-dancing class on Wednesday we were attempting chest-slides. When it was my turn to be checked the teacher observed that, in addition to all the other things that were wrong (“but you’re in good shape for a woman with two children”), I was holding my weight too far back over my heels. Then she said that the baby was still in my aura and I should imagine red light going down through my knees. I’m not sure I’d put it the way she did, but it was salutary to realise that I’m carrying Frank even when I’m not carrying Frank; that the way I walk and how I balance my body are shaped around my baby. I’ve started to spend a little more time away from him, at belly-dancing for instance, but it is still hard to contemplate managing whole days apart, let alone several in a row. At night I curse slightly when I can’t get him to settle back down in the cot and have to bring him into the bed to sleep, but I love the warm puddingy softness of his body snuggled against mine. How could I leave him? Hugh on the other hand is rather easy to leave this week. His horrible switch is stuck in the on position, which means rejecting his food, fighting being dressed, fighting his nappy-changes, possessiveness over toys, throwing toys, pushing other children, whining and sobbing all the time and saying no to every suggestion we make (“No walk! No dinmah [dinner]! No clothes more!” etc etc). All he seems to want to do is watch DVDs and run around bashing into things and making explosion-noises. He has been waking early again – 5.10am today; Ken got up, bless him – and also has a slight cold. These are partial explanations for his awfulness but one still does a spot of parental soul-searching. What did we do to deserve this and do we have the energy to tackle it? Still, I have some faith that we will get over this particular hump. Hugh’s horribleness does tend to go in cycles; only two weeks ago I was contemplating how fascinating and delightful he was. But it will be Ken who chiefly suffers the next rotation. On Friday morning a smart lady doctor in Blackrock fitted me with an IUD. All the rest of that day my womb ached with trying to bring its fingerless grip to bear against that fiddly alien. A little t-bone of plastic and copper wire instead of a baby. I need to produce words now, and ideas, and teaching plans and student lists and conferences. I like my work and am looking forward to getting back to it. But it will be a kind of exile. I’m not sure where to start with this. The beginning, obviously; but I don’t think I can convey what it was like just by saying what happened. It was such a straightforward birth and it all went pretty much to plan, even though (as last time) it took me at least half the labour to be thoroughly convinced I was in labour at all. It was a birth as birth is supposed to be – quite ordinary in its way, not frightening, the body doing its job: wonderful, exhilarating, painful, tedious, dramatic, normal, amazing. It was a beautiful birth. And I must say that it was very nice to have the midwives there this time; they were brilliant. I woke in the small hours on Friday morning, perhaps around 2.30. I was having twingy, tight sensations in the lower abdomen that had started in my dreams and carried on into wakefulness. They weren’t very frequent or very painful. Were these contractions? They seemed to be continuing, and I noticed that Sprout would start to move a little before each one came. At 3.45 Ken seemed to be awake so I told him rather tremulously that I thought I was having contractions. Ken’s reaction was to be frustrated that he hadn’t got round to downloading the contraction timer program for his iPod Touch. We lay in bed for a bit talking, Ken practical, I hesitant. The contractions were so light and I didn’t want to call it too early – what if they were just practice niggles? What if it all went away in a few hours and started again tomorrow night? But Ken went downstairs and began to inflate and fill the pool. From this point on I became more and more absorbed in my labour, while Ken rushed around putting out mats and towels, getting Hugh ready and out to the childminder, and checking the temperature and depth of the pool (with the aid of a thermometer in the shape of a rubber duck kindly lent us by Sinead). I took up a position kneeling in front of the sofa, which was surrounded with mats and protected with a couple of waterproof pads and a towel, and this in fact is where I stayed until Frank was born with the exception of frustrating lurches to the bathroom. When each contraction hit I burrowed into the seat with my head on the cushions, much as I did last time with the beanbag, and breathed deeply. With Hugh I remember the pains as being largely in my back and achey in character, which is the kind of pain I get during periods, and the urge to lean forward was driven by wanting to get the weight off my back. This time I experienced the pain as sharper, lower and more to the front, similar to wind, but I still felt a strong need to bend forward, and I was using the breath to try to make some space deep in my abdomen. In case my yoga teacher should happen to read this I wish it to be noted that I did my three-stage yoga breathing, if not with text-book strictness. When Ken got back from dropping Hugh off he called the midwives again on my behalf. They tell you it should be the woman who calls, but at this stage I couldn’t face the idea of getting a contraction while I was on the phone and I wanted to stay where I was. Ken encouraged me to get in the pool he had so lovingly filled, but I didn’t want to play the trump card too early and I decided to wait until the midwives had confirmed I was at least 4cm dilated. At ten to nine the day-shift midwives, Bernie and Kate, arrived. I was very happy to see Kate because she did two of my home visits and also spoke to me on the phone when I got the results of the GCT (blood test for gestational diabetes), but it was actually Bernie who gave most of my hands-on care and stayed with us for some hours after the birth. As previously mentioned, the midwives were wonderful; they whisked everything into place with complete calm and efficiency and made us feel that nothing could possibly go wrong while they were there. Again they checked my tummy, my blood pressure and the baby’s heartbeat; Bernie pronounced him to be ‘a very happy little baby’. Moving to lie on the sofa to have my tummy felt was an effort and brought on a mini-contraction while I was there – I had to turn onto my side to cope with it – and Bernie said she would wait a bit before doing an internal. As it turned out, that meant this was another labour in which I had only one internal and that very near the start. Kate and Bernie then asked if I would like to have my back massaged or if I would rather they went into the other room and left me to do my thing. I wasn’t sure, but I asked to try the massage and find out if it helped. So Bernie started to prod her way down my spine and apply counterpressure at the base when the contractions came, talking me through them and helping me release the tension I was still holding in my buttocks and shoulders, despite all the breathing. ‘Relax your feet’, I remember her saying; ‘relax your ears.’ The massage was more a distraction than a relief in itself, but it gave me permission to go off completely into my own place, not emerging between contractions but staying with my arms and head on the sofa and focusing on my breath. The surges became more and more intense so that I was beginning to moan aloud – so good to moan and not care and ride the pain – until quite quickly, and without warning for me (though I’m sure Kate and Bernie saw it coming) I began to shout and it turned to pushing. A bulging sensation like a vast, hard bubble, so painful – I don’t remember being that aware of the pain of the second stage with Hugh – but never quite too much, and then, like in all the stories, Bernie told me ‘pant through this one’ – which wasn’t difficult, it was more about not rushing it than resisting the heave – and then ‘reach down and touch your baby’. The vernix felt like a rather dry yoghurt. ‘Now comes his body’, and out he came. They passed him through my legs and clumsily and shakily I took him, with the umbilical cord dragging rather uncomfortably against my private parts. My nightie was manoeuvred off around the cord and I was helped to sit down on the sofa. As set out in the birth plan, I took the injection and the placenta followed speedily and without fuss, in welcome contrast to the rather anxious wait we had last time; once a good ache had buiIt up they told me to kneel forward and it plopped neatly into a little tray. I had no tearing (hooray! ), just a small graze that didn’t require attention. After a short while I was helped into the kitchen and assisted to climb at last into the pool, and there I wallowed in the delicious hot water and gave Frank his first, somewhat inexpert feed. So Ken’s efforts were not wasted; it felt lovely. I was also very happy to be able to wash Frank immediately. One of the things I remember about the days in the hospital after Hugh was born was that he had a blood-clot in his hair and I was longing to wash it off, but he wasn’t given a bath until the morning we were discharged. So this was my experience, as far as I can tell it, of the birth of our second son. He was most considerate in his arrival; he timed things nicely so we could get Hugh out of the way without disrupting his sleep and then have most of the day to recover and settle in before he came home. It was probably marginally shorter than my first labour, though it’s hard to say as we don’t know when active labour started in either case. I certainly went from zero dilation to the birth in about four hours. I never noticed my waters breaking; apparently they went just before the birth. Frank weighed seven pounds and was born ten days early, at 9.28am, on my parents’ wedding anniversary, which is also the day after my mother’s birthday. And here he is, named at last. Baby number 2 tucking in to a first breakfast as mum Dot relaxes in bath. 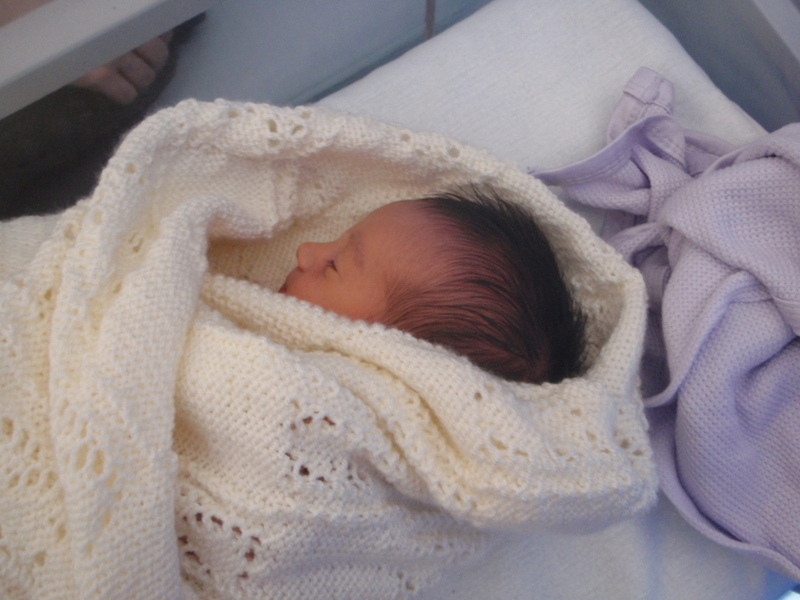 born 18 September 2009, 9:28am, at home, weighing 3.18kg (7lbs).